This is the independent transport videos fifth visit to the Merseyside Transport Trust’s annual Running Day that took place on the 11th September 2011. As in previous years the action takes place at the Pier Head and the smart Liverpool South Parkway transport interchange. The event is a showcase to display the superb collection of buses owned by the Merseyside Transport Trust as well as visiting preserved vehicles – nearly all having a local Liverpool connection – in the shape of Crosville and Ribble. Our filming starts at Pier Head and Mann Island, with a backdrop of the familiar buildings that make up the Liverpool skyline. The latest arrival in the MTT fleet is 2160 (MUA 45P), a Bristol LHS6L with an ECW body smartly turned out in the Verona green and jonquil livery. This little bus came from the West Yorkshire PTE fleet to Merseyside to operate on special community services. Now restored to MPTE livery, we see it operating a variety of ‘circular’ services. At Pier Head most of the arrivals and departures are captured on film, not just the Liverpool Corporation, MPTE and Merseybus vehicles, but a Crosville Lodekka, two Crosville Bristol REs and a Ribble Leyland PD3/5 and Leyland National which add colour to the busy transport scene, which is sure to bring back happy memories! We then board Leyland Atlantean 1365 (DKC 365L), preserved in ‘Wirral’ blue and cream livery, for a ride on service 4 to Penny Lane. 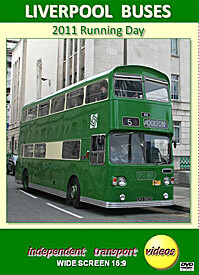 This bus was delivered new to the Wirral Division in 1973, but moved to Liverpool and painted green in 1984. The vehicle movements are captured at Penny Lane before our cameras get on board Leyland Panther 1054 (FKF 933G) for a ride to Liverpool South Parkway. There is plenty of action here for you to enjoy as most of the services pass through this busy interchange. We even filmed the recently arrived from Arriva London, Mercedes Benz Citaro articulated bus, now operating on the Liverpool Airport service. This provides an interesting comparison with our ‘heritage’ buses on the Running Day! Its now time to board former Crosville dual purpose Bristol RELL6G, ERG52 (UFM 52F) for a ride to the Pier Head on service H1. An enjoyable ride listening to the sounds and going back in time – especially as we pass a former Crosville Lodekka going the other way! Back at Pier Head and Mann Island we continue to film the arrivals and departures of this fantastic event as the day draws to a close. We would like give a big thank you to everyone that has been involved in organising this excellent Running Day, keeping those transport memories alive!